Camp Followers or Women of the Army? Soldiers and Camp Followers Resting from a March. Jean-Baptiste Pater, 1730. private collection. used from Wikimedia Commons. I prefer woman belonging to the army, or “regimental woman,” which sounds like Mick Jagger or Roy Orbison could sing it, but one could have a pretty lively discussion of which term to use. 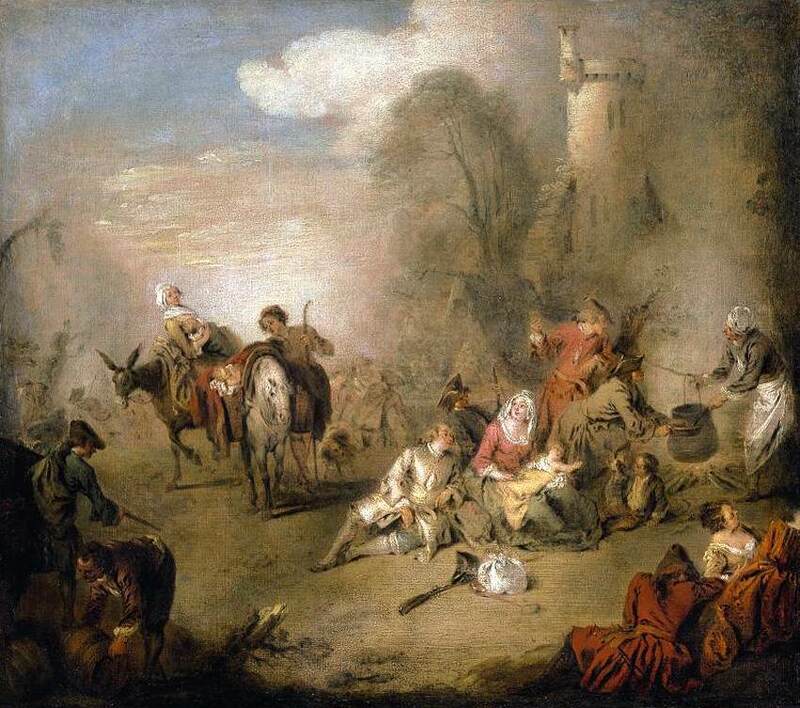 Camp followers has a connotation–prostitute–that doesn’t reflect the full reality of army life for women in either the British or the Continental armies. Were there prostitutes who took advantage of the proximity of a large customer base? Yes, undoubtedly. In the John Robinson Waterman Papers there is an unusual letter from Col. William Battey dated October 28, 1812 with a sketch of the army camp near Albany and a description of camp life. This description includes the treatment of a woman accused of prostitution and summarily banished from camp. I think she was beaten and half-drowned, so the army took the no-prostitutes-whatsoever dictum very seriously. As far as cooking goes, a commenter elsewhere explained that women would have been cooking, at least for themselves. Typically, they did not cook for the soldiers’ mess, unless they were being paid to. This must have been a difficult situation for the Continental Army: when women were present, it made excellent sense to assign them all possible non-combatant tasks to ensure the maximum fighting force. But could discipline be maintained? Not always, given Bridget’s temper. Rolling back a bit and trying to consider the army’s structure and camp layout, what are the mechanics of handling rations for women with the army? How are they fed? And did it vary, unit by unit? There is probably far more variation than we credit, that will only be illuminated by careful attention to the documentary record. That means finding as many victualing rolls and returns as possible, looking for women. It means reading all the orderly books that can be found, looking for women. The best secondary source I know for the Continental Army’s women is with Holly Mayer’s book, Belonging to the Army. (And I’ll admit I haven’t read it in two years, so it’s time to re-read it.) If you’re British, I’m not in a position to help you as much, but there is Don Hagist’s work on Women of the British Army. For a more granular understanding of women in all armies, you have to turn to primary sources, and what’s available varies from unit to unit, state to state. There is a handy index of orderly books, and while these vary in their utility, they are a good place to start. In fact, the whole RevWar 75 site is useful (though it is not loading at the time of this writing). Soldiers’ diaries and accounts are also useful. 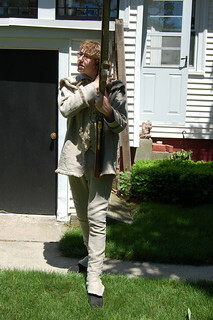 Jeremiah Greenman of the 2nd Rhode Island Regiment recorded his experiences throughout the entire war, starting in 1775, when he joined Arnold’s expedition to Quebec. There were two women on that expedition, attached to two different companies. While there is not a plethora of detail about the women, it is clear that they were strong and able, and in one case, more able than her husband. 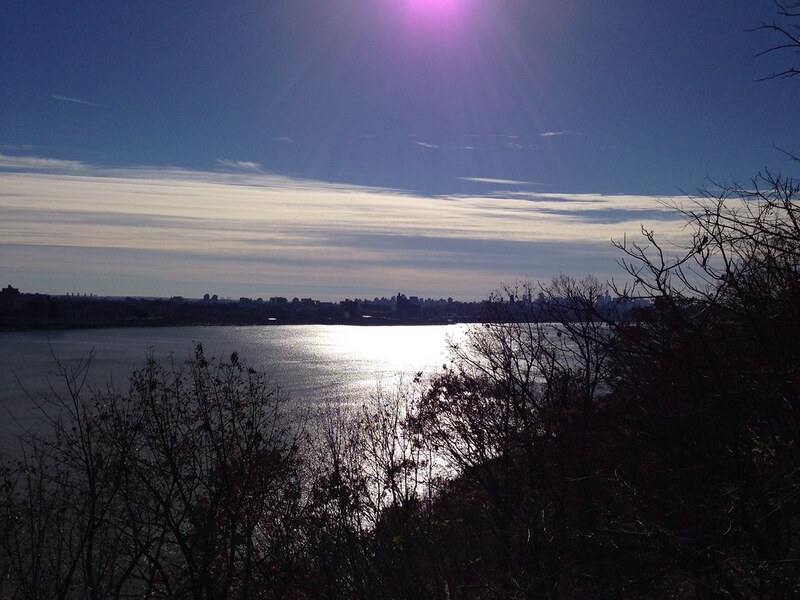 Silver and shimmering, there’s Manhattan Island: you can hear the train whistles from the New Jersey shore, this century always intruding on the past. To be honest, this event makes me as nuts as it makes me happy (the 32 pound gun did, finally, go off after four tries). There’s something slap-dash about it, this last event of the season (or the first of next, as the BAR commander would have it). The range and quality of impressions is astonishing but it’s a small, manageable event that’s good for trying things out, and for first-time-users. Which could bring me to the highlight of the day for someone close to me, but suffice it to say that what happens in the blockhouse stays in the blockhouse and I haven’t seen a particular teenage boy that excited, like, ever. He stayed excited, too, until he finally fell asleep somewhere on I-95 northbound. Mourn Arms at the end of the Day. I like the predictable ritual of Fort Lee: it’s always cold, the sun fades around noon and the light is always pale by the afternoon, the guns are always fired, and the blockhouse is always lost. There’s a ceremony up in the town and the square always smells delicious, the kettles are always full of mysterious stew with some charcoal bits mixed in and the kid always has three bowls full. 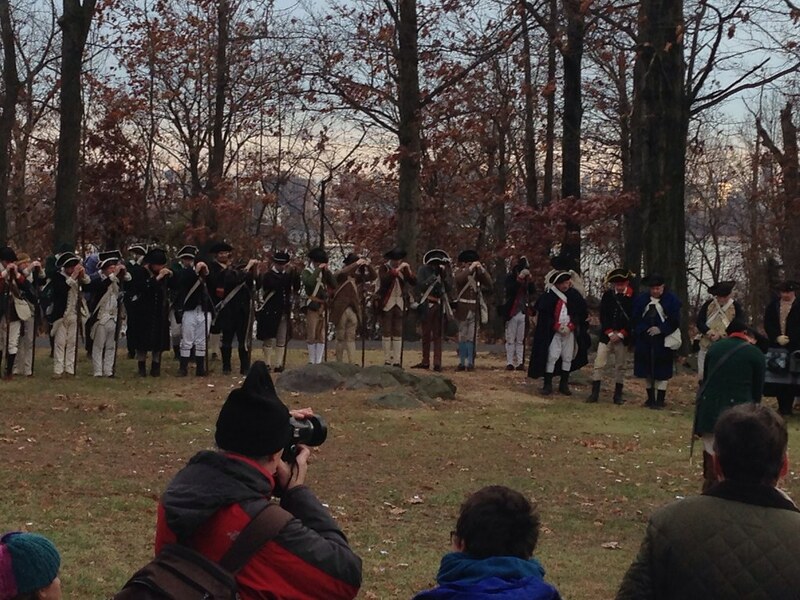 There are always a lot of photographers stalking the ‘wily and elusive reenactor’ at this event; there’s a Fort Lee photo club and they come every year. Unlike Tower Park, there’s no touching, just long-lens stalking. It’s a little weird and I try not to laugh but the lengths they go to do are funny, somehow, though it’s just someone else’s hobby and obsession. The comments in the public are always revealing. This year’s prize goes the gentleman who told his son muskets are slow to fire and hard to use because they’re breech loading. I think few people have much experience with the physical world, and we would be well-rewarded for spending some time thinking about larger themes in our interpretations, as I’m not convinced people come with much context for what they’re told or what they see. 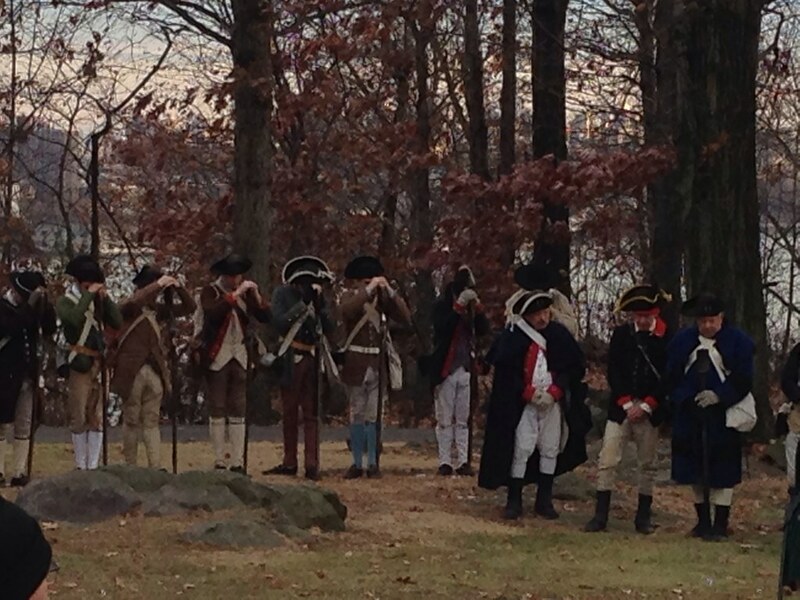 The Four in Brown, portraying Colonel Moses Little’s 12th Continental Regiment. Mr S could not remember the name of the regiment they were portraying when I asked him to remind me: the best he could do was “Colonel Sanders’ Regiment,” which was thankfully taken in good spirits when confessed, but you have to know that a man who has managed to get potato on his hat is, well, let’s call it befuddled with hunger. We were probably all a little punchy with cold when the conversation turned to the overheard remark that there would be parakeet [parapet] firing. I asked how many parakeets it took for a four pound gun: four. And then we were off on a flight of fancy noting that loading the guns with the birds would clean the barrels on the way down, and that a parrot, beak forward and in flight, had a fine and aerodynamic profile, but it is damned hard to load the birds tail-first. [Insert squawking noises and some broadcloth-sleeved arm flapping.] After this, we had a demonstration of a simple rapid-fire musket exchange principle which I believe may have been employed to some good effect in the blockhouse. On the way down, we had spotted a woman driving with a small parrot on her shoulder, loose in her small car, with a cage in the back, so the day really began on a parrot and parakeet theme, though the Free Men of the Sea were parading in Plymouth. All in all, a very typical, slightly surreal Fort Lee. 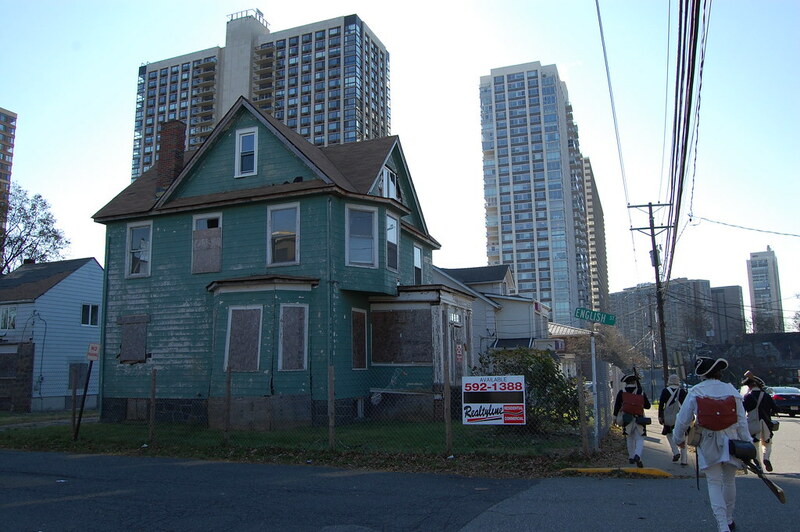 Fort Lee: It’s a mixed bag. Fort Lee is a mixed bag: the site is very urban, authenticity levels vary, the activities sometimes get off schedule, and I don’t think anyone knows for certain what goes into the stew pot. Still, it’s an easy there-and-back dash, and all of us are going now that Sunday’s swim meet is cancelled. And I’m just happy to have a day outside to look forward to. It’s a little dull without a fire and tent, but the event has its quirky charms, and I can always bring a book or work on shirts. They’re not Mr S’s favorite thing, and I can understand why. 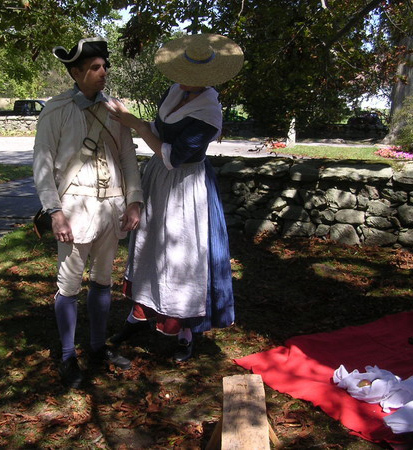 Hunting frocks lack pizzazz, buttons, tape, lace, lapels, skirts and all the things that make him so fond of the Ugly Dog Coat worn by the 10th Massachusetts in 1782. (I think these are the coats captured from British supply ships and dyed at Newburgh and West Point in tanner’s vats.) But what he has right now is a hunting frock. Here’s the kid in his new hunting frock, and a hand colored copper engraving by Johann Martin Will from 1776. You gotta hold your tongue just right when you drill. 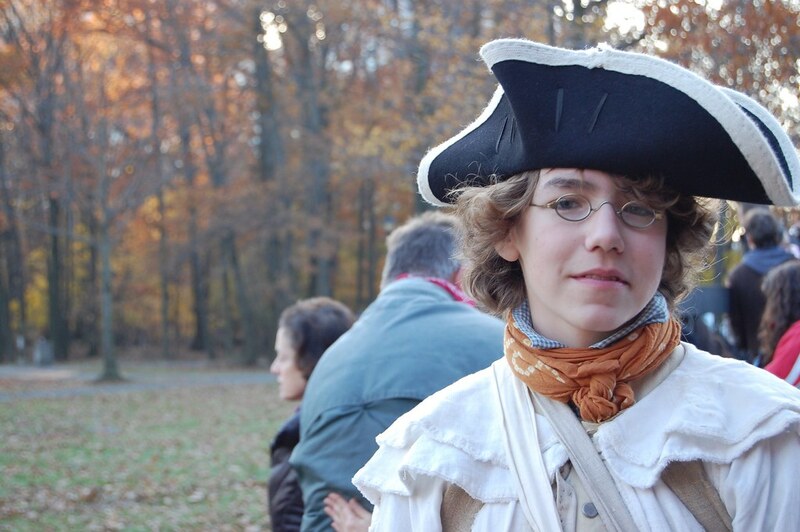 Americaner Soldat, Johann Martin Will. Ann S. K. Brown Collection, Brown University. And then there are the colored and plain engravings, “1. 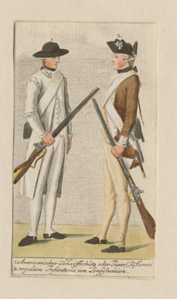 Americanischer scharffschütz oder Jäger (rifleman) 2. regulaire infanterie von Pensylvanien,” engraved by Berger after Chodowiecki. I started thinking about these again because not only am I reading Hurst’s thesis, but I’m fresh from helping the guys get dressed and arrange their capes and straps. 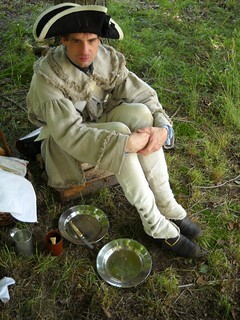 I have been doing that as long as Mr S has been wearing historic clothing. The hunting frock drifts if it does not have some kind of fastening at the neck. 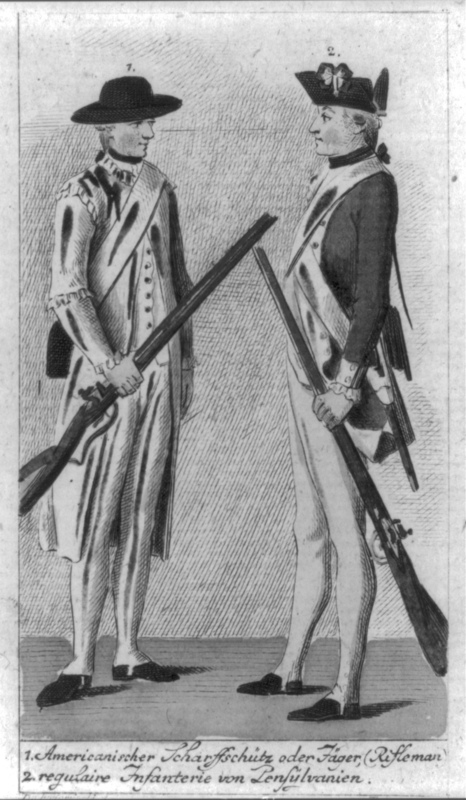 The two halves migrate in opposite directions, and while belts help, the light infantry bayonet shoulder belt does not contain the hunting frock as well as one might like. So the thing to do, I think, is to attach a loop and button at the neck to hold the garment in place. From the period engravings, I think that’s acceptable. The garments all look as if they are closed at the neck. From the evidence in the field, and from the images, I plan to make loops and attach buttons, and hope that will limit some tendency to wander. Authenticity: Sources II, or, Stripes! In any decade, I love stripes. Stripes. I love them, really, I do. Gowns, petticoats, cats. Why do I want to use them so much? For the guys, because I can document what they’re wearing, at least based on their current state of residence and their current nominal “home” unit with the BAR. This inventory has formed the basis for many of the clothing choices I’ve made for Mr S and the Young Mr from their check linen shirts to their blue stockings. I was criticized for the size of the checks of their linen shirts (too small! I heard), but feel vindicated time and again by the extant garments I’ve found (aprons, mostly) in this period. The checks are small. The best piece of evidence I found was serendipitous: whilst going through tailor’s books Thursday, looking for stays, I found a scrap of blue and white checked linen used as a binding. The biggest lesson from that scrap is that I need a deeper, more indigo-rich blue and white to begin with. There are extant Rhode Island garments from made of blue striped linen, documented to the period we interpret, and another one, recently acquired (coming soon to a database near you!) from which a pattern has been taken. After a while, though, blue stockings and checked linen shirts seem…ordinary. Common. You might start to wonder if they’re just another re-enactorism, they’re so ubiquitous. 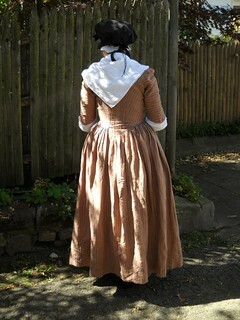 It’s worth checking again to see that these are, in fact, common garments, probably as prevalent then as they are now.